A team of Navy SEALs is dispatched on an international manhunt after discovering a deadly terrorist plot against the United States. The men of Bandito Platoon must stop the attack before its execution kills and injures thousands of innocent American civilians, including their own families. 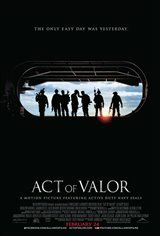 Act of Valor tells the very real stories of how soldiers are forced to balance their duty to their country with the their commitment to their families at home. The film uses active duty U.S. Navy Seals as actors. The characters they play are fictional, but the weapons and tactics used are real. "I understand more now of the Navy Seals and how do their jobs and the skills they have. Very moving tribute to them all and their families. So glad this movie was made using actual Navy Seals and not actors. God Bless them all." "there's a reason, no known actors are in this film. it's the ishtar of action films." "awful excuse for a film."